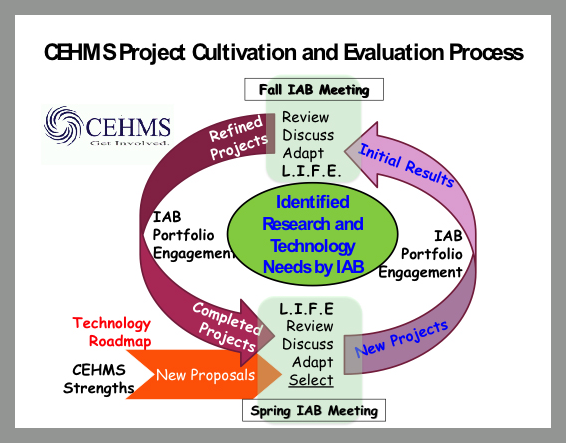 Projects are selected during the Spring meeting by the industry advisory board (IAB) from a list of proposed projects by CEHMS core and affiliate faculty members. The cultivation process follows the NSF recommended format as shown in the figure and PIs of proposed projects give presentations during the meeting. Each approved projects has duration of one year. The IAB and interested industry members monitor all projects. All projects must be reviewed in the Fall meeting with no requirement for decisions on any project if satisfactory progress is being made. All projects must be reviewed in the Spring semester and a board’s decision regarding the continuation of each project is expected during this meeting. The industry/university interaction within the center is evaluated using both qualitative and quantitative methodologies. Currently, surveys and individual interviews with faculty, students, and industry participants are used to gain information on the satisfaction of individuals with the quality and impact of the center on implementing innovative energy harvesting technologies. One-to-one interaction with IAB has been significant in the evaluation process. Because this evaluation is designed longitudinally, repeated surveys and interviews are conducted over time, with special interest given to how the interactions of the center have affected the work and perceptions of the participants. In addition, entry and exit surveys have been conducted to assess the satisfaction level of students (both graduate and undergraduate) and technical staff who conduct research at the center.